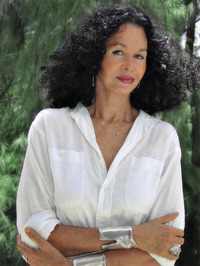 Kiana is the author of the internationally best-selling novels, SHARK DIALOGUES, SONG OF THE EXILE, HOUSE OF MANY GO KIANA DAVENPORT is descended from a full-blooded Native Hawaiian mother, and a Caucasian father from Talladega, Alabama. Her father, Braxton Bragg Davenport, was a sailor in the U.S. Navy, stationed at Pearl Harbor, when he fell in love with her mother, Emma Kealoha Awaawa Kanoho Houghtailing. On her mother's side, Kiana traces her ancestry back to the first Polynesian settlers to the Hawaiian Islands who arrived almost two thousand years ago from Tahiti and the Tuamotu's. On her father's side, she traces her ancestry to John Davenport, the puritan clergyman who co-founded the American colony of New Haven, Connecticut in 1638. How retrograde is this: One of the first film producers interested in Crazy Rich Asians wanted certain key roles to be rewritten as Caucasian. Shocking? Not if you know Hollywood's history of whitewashing - the practice of casting white actors to play minorities - Asians, African Americans, Native Americans, Pacific Islanders and so on.
" Susan Thank you for your support! I don't know if Goodreads will let me do this, but here is the link for ABC optioning Shark Dialogues. If it doesn't Susan Thank you for your support! I don't know if Goodreads will let me do this, but here is the link for ABC optioning Shark Dialogues. If it doesn't work just google "Hollywood Reporter/Shark Dialogues" Alohas, thanks again.
" Dear Andrea...Ondaatje is a brilliant writer. I recommend all his novels esp. The English Patient, also a brilliant movie. I congratulate you on your Dear Andrea...Ondaatje is a brilliant writer. I recommend all his novels esp. The English Patient, also a brilliant movie. I congratulate you on your good taste! The printed word is always better than audio becoz you can reread and reflect. tho its easier to drive a car etc. and listen with audio. He has a new novel Warlight. I just ordered. My novel Shark Dialogues has just been optioned by ABC as a novel/possible series.
" Oh Yes! I forgot that I absolutely loved Oscar Wao. In spite of the f- word. (Which I use all the time! But try to use sparingly in my writing. ) Some Oh Yes! I forgot that I absolutely loved Oscar Wao. In spite of the f- word. (Which I use all the time! But try to use sparingly in my writing. ) Somehow his latest novel didn't entrance me. But every book can't be a stunner! By the by...who am I kidding? ?...when I teach the kids at home in Hawaii every word out of their mouths is f---. In their term papers, too. I don't do Goodreds much these days trying to finish a new novel, but do enjoy your book choices. Of course! You taught so your a word lover! Happy Reading! And god help our country in the current state of affairs! alohas, Kiana ...more "
We’d love your help. Let us know what’s wrong with this preview of Helter Skelter by Vincent Bugliosi.
" Susan, you have excellent taste. Hurston was a brilliant writer, ahead of her time, and buried in history until rediscovered by my friend Alice Walker Susan, you have excellent taste. Hurston was a brilliant writer, ahead of her time, and buried in history until rediscovered by my friend Alice Walker. As a woman of color (Half-Hawaiian) I read her words and understood that I needed to address the issues of color and race and gender inequality further in my own writing. First and foremost she was and is a voice of purity that addresses spirituality and religion like no other writer I know of. I have loved her works! Happy reading and again congratulations.
" Aloha Chinmay...Happy to see you are reading...but are you writing as well????? You're so talented, please pursue that talent. Per capita, India is no Aloha Chinmay...Happy to see you are reading...but are you writing as well????? You're so talented, please pursue that talent. Per capita, India is now the most populous literate country in the world. Think of all the readers! Alohas with affection, Kiana ...more "
What is Realistic Fiction? It is a fiction based on real events, having real locations.